Ukulele teacher Mele Fong dances hula at the Maui Ukulele Festival as Richard Hoopii and Richard Tom perform “Puamana.” Singers and ukulele players will sing songs of the Hawaiian Islands as part of the Sing-Along with Mele Fong series on Thursday, August 16 from 10 a.m. – noon at Kaunoa Senior Center for adults 55 and better on Maui. 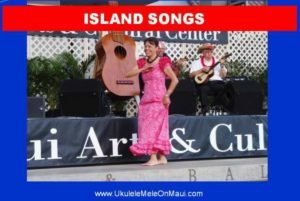 Singers and/or ‘ukulele players will sing songs of the Hawaiian Islands as part of the Sing-Along with Mele Fong series on Thursday, August 16 from 10 a.m. – noon at Kaunoa Senior Center for adults 55 and better on Maui. The theme was chosen to celebrate August 21, 1959 when Hawaii became the 50th state of the union. Read more about Hawai’i Admissions Day in my blog post.